Alisa Golden: "As I worked on my first book of poems during my first semester at California College of Arts and Crafts, my teacher, Betsy Davids, suggested that I choose a press name. The book was called never mind the crowd, so it seemed fitting that never mind the press become its imprint. As evidenced by the poetry, I liked wordplay. Choosing never mind the press seemed an offhand way of making something serious and not serious at the same time." Berkeley, California: never mind the press, 2016. Edition of 34. 2.5 x 2.5" paper box. Box interior painted pearlescent gold. 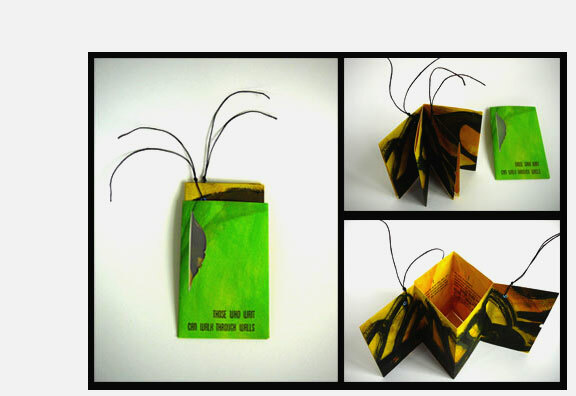 Houses 2.1 x 2.1" miniature book with 14 pages, cloth over boards. Letterpress printed from handset Univers type. Book title "I Found Out" printed in wood type." Photos inkjet printed. Signed and numbered by Golden. 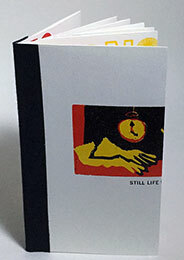 Alisa Golden: "Overlooked and overheard people and things are the subject of this palm-sized box that contains a miniature accordion folded book. The overheard conversations are letterpress printed on the outside of the paper box. The words "I Found Out" are also printed in wood type. Inside is painted pearlescent gold. 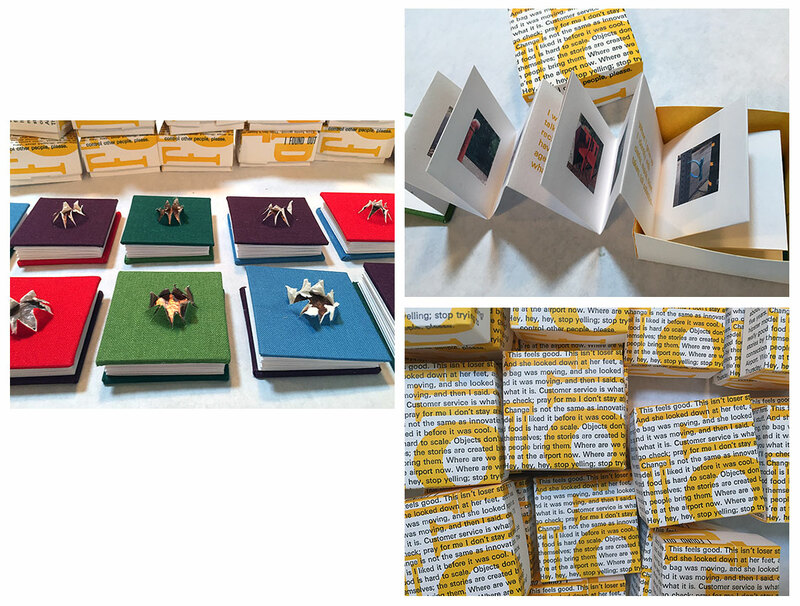 "The miniature book has inkjet printed photographs of objects I found out on my walks with a short poem about shyness and people taken for granted printed via letterpress in yellow ink. 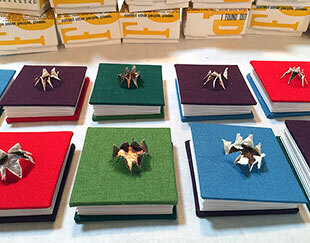 The covers are mix and match in thirteen combinations, boards wrapped in book cloth I found in my studio from other projects; a penny is inset in the cover of each. "The first color is the cover color. Choices are: forest green, leaf green, bright cherry red, wine red, sky blue. Berkeley, California: never mind the press, 2015. Edition of 40. 5 x 7"; 10 pages. One-sheet folded book. Letterpress printed from handset Univers and wood type and photopolymer plates on Stonehenge, a thick, acid-free paper. Laid in a tan Stonehenge title folder that contains the colophon as well as the title. Signed and numbered by the artist. 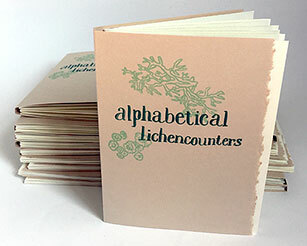 Alisa Golden: "In this special alphabet book, drawings of a variety of California lichen are printed in the counters (the open areas) of selected wood type letters. Also printed from handwritten text are the intriguing and poetic names in Latin and English, such as 'crowned pixie-cup' and 'seaside tube lichen,' 'wolf lichen,' and 'hopeful beard' lichen. … In the center folded section is a prose poem about lichen and their symbiotic relationship, how humans cannot cultivate them, and how they are pollution predictors." Berkeley, California: never mind the press, 2015. Edition of 39. 6 x 10 x 1.5" as paper sculpture; 21.5 x 10" fully extended as a print. Letterpress printed from linoleum cuts and handset Caslon Oldstyle type in six colors on cotton Stonehenge paper. Signed and numbered by the artist. Alisa Golden: "So many times a book is judged by its cover. Here is the cover, the jacket as a paper sculpture, the book fully exposed, easy to flatten and store or mat and frame as a print. These five poems look at honesty, service, invisibility, power, and irony through cleaning, team training, military awards, a bug, and clichés. The prints are of bald eagles, a target, and combat boots and talons. Taken together, a powerful and playful set of words and images." Albany, California: never mind the press, 2014. Edition of 30. Sizes and colors vary: 5.5" (w) x 8.5 - 9.75" (h). Mixed colors with front covers of: black, dark blue, red, dark green, gray, white, process blue, or brown. Materials: Arches cover, repurposed book covers, muslin, Stonehenge, Velin Arches, kitakata, Japanese book cloth. Letterpress printed from Caslon Oldstyle 471 type. Linoleum cuts. Signed by the artist. Numbered. 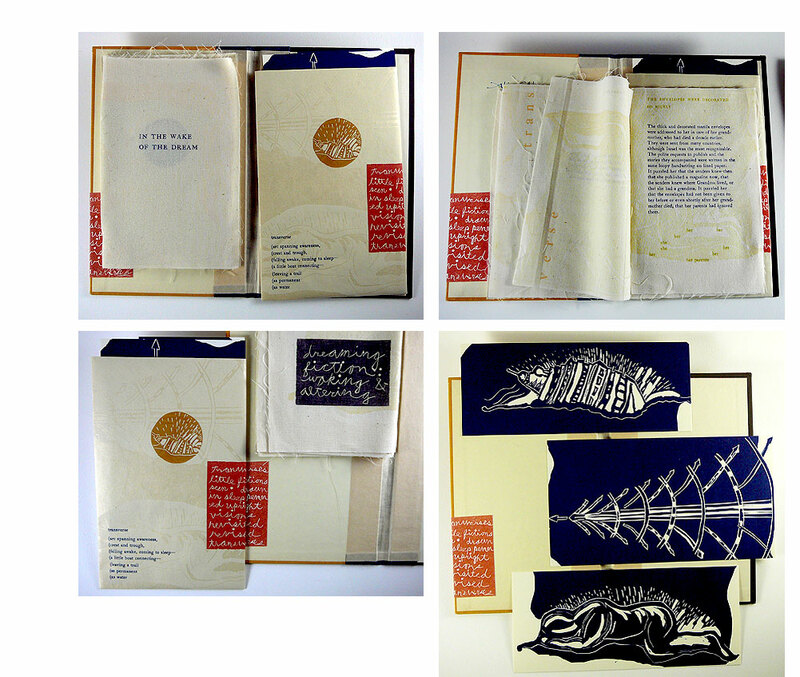 Alisa Golden: "A slipcase holds a hardcover portfolio made from discarded book covers. 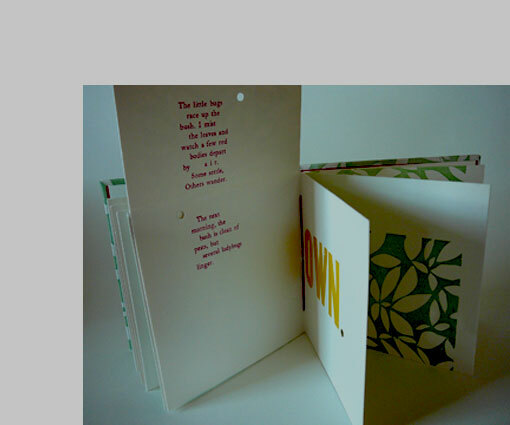 Inside the portfolio you will find a slot and tab book letterpress printed on muslin cloth from metal type and linoleum cuts in several colors. Each combined fiction/dream is printed in blue with the waking words trailing in gold. Three linoleum cuts are printed on Stonehenge (a ship, diagram of a wake, and a sleeping body) and held in a handmade kitakata envelope with a poem called 'transverses' printed on it. "These narratives are five consecutive dreams from March 31, 2014, then revisited and revised asleep and awake shaped into stories (transverses) touching on imagination, loss, relationships, and acceptance." Berkeley, California: never mind the press, 2014. Edition of 45. 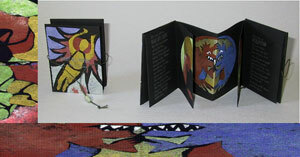 Outer fishbone fold book measures 6"h x 3.5"w; inner folded booklet is 5.5"h x 3.75"w. Archival and acid free papers. 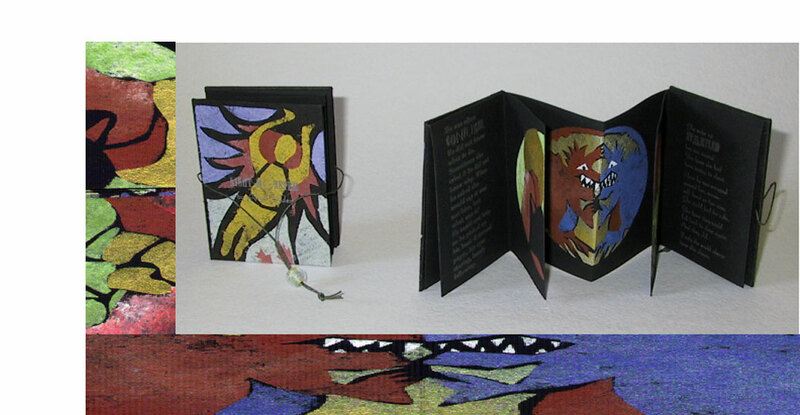 Three-color reduction linoleum cut on the front cover and on the back cover. Printed by hand on Strathmore drawing paper. Letterpress printed. Lino cuts. Black book cloth spine. 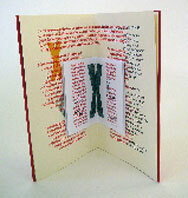 Modified fishbone fold has a pocket at the apex with the poem tucked into it. Bound by hand. Signed and numbered. 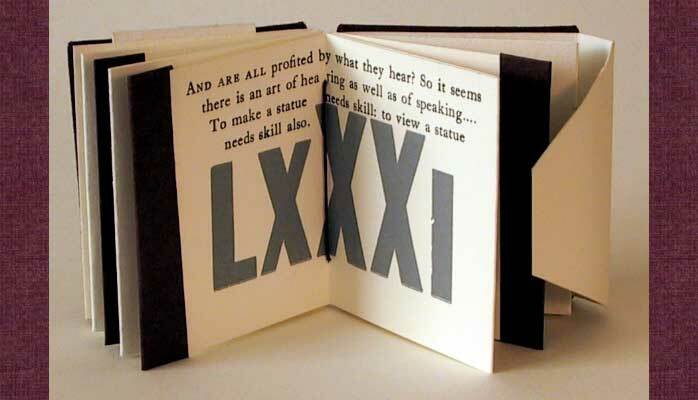 Alisa Golden: "This freestanding, sculptural, two-piece book is letterpress printed from wood type, handset metal type and original linoleum block illustrations. The poem contained within was inspired by the 'Fight for 15' campaign for a fair minimum wage for fast food workers and other service workers and originally published in the online literary magazine, Miracle Monocle, Spring 2015 issue. "The illustrations were designed after studying the 1602 painting, 'Still Life with Game Bird, Fruit, and Vegetables' by Juan Sánchez Cotán and given a contemporary interpretation. Colors were chosen to evoke a fast food outlet." 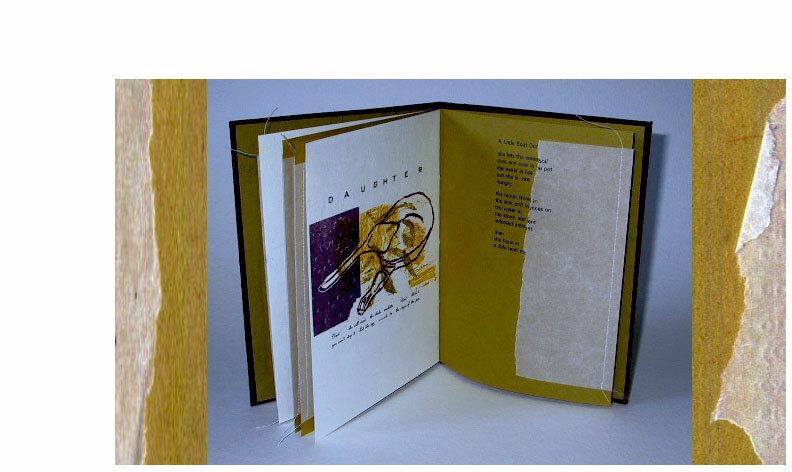 "Here is the latest, just in time for National Poetry Month and for Poem in Your Pocket Day (April 30, 2015): a single poem on a folded and glued sheet in the pocket of a modified fishbone fold. The design came in a dream … I printed the yellow, carved out what I wanted to remain yellow, printed red, carved, then printed black on top of all. Conceptually, I was playing with borders and boundaries, having type and images spill over from page to page, and placing the poem tight against the inner fold. "The finger cutout echoes the shaped opening of the french fry bag. The wood type words are from the poem." Berkeley, California: never mind the press, 2013. Edition of 24. 10.5 x 5.5"; 18 leaves. Letterpress printed with Caslon Oldstyle type. Illustrations reduction linoleum prints. Papers: Frankfurt, glassine, and Paperwood. Wood veneer paper tipped on front pastedown. Colophon with an abstract print made from the remnants of the final linoleum blocks tipped on back pastedown. 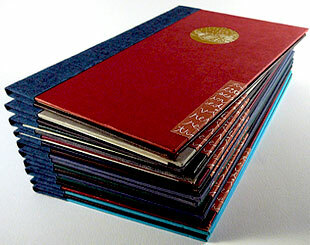 Bound in midnight blue book cloth-covered wraparound boards with magnetic closure. Inset paper title label with cropped image on front cover. 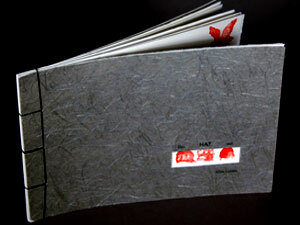 Includes booklet laid in: 2 x 5", 8 pages including wraps. Reduction print in glassine tied to interior page. Signed by the artist on back cover. never mind the press: "Each signature is created from a folded glassine page that opens to reveal a silhouetted, multiple-color linoleum print of a tree branch with a personal significance: Magnolia, Camphor, Silver Dollar Gum Eucalyptus, Hawthorn, Liquidambar, and Live Oak. 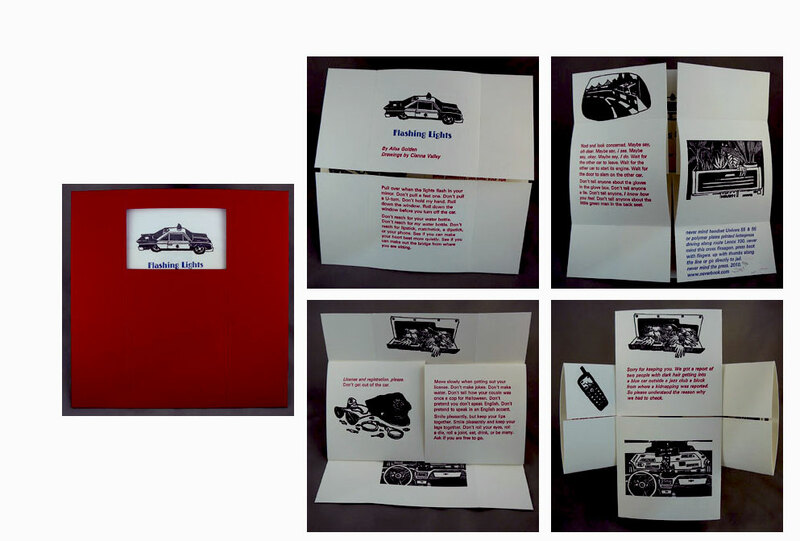 Short creative nonfiction pieces are letterpress printed from handset type on the glassine. 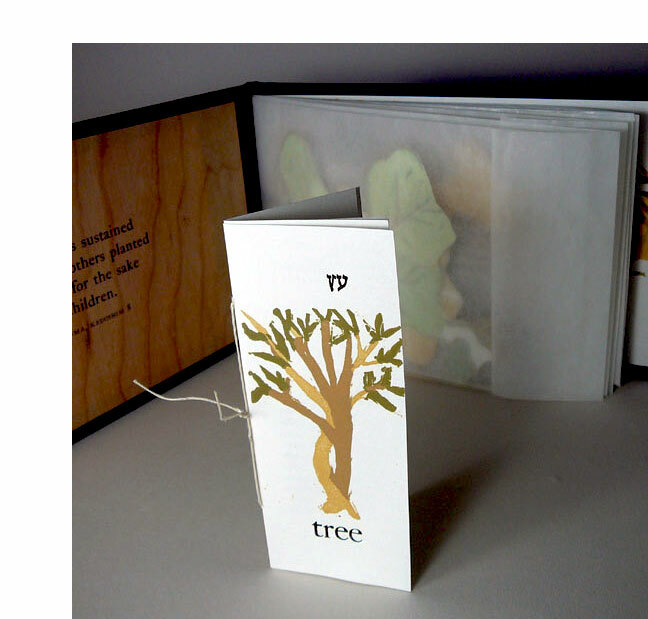 ... Also included is a narrow booklet with a fictional modern folktale and a seventh reduction print of a Russian Olive tree." Colophon: "This book grew out of a dreamvision, meant to be dedicated to the memory of Ezra (1997- 2003), but Nana kept appearing in my dreams for a week until I embraced her also: Dorothy Singer Simon (1911-2003). May their memories be for a blessing in this tenth year of their absence. ... It has become a Jewish custom to plant a tree in honor or in memory of one we love ... since 1901, over 140 million trees have been planted in Israel in honor or memory of loved ones. One shovelful of dirt buries the dead, another starts a tree's new life." Berkeley, California: never mind the press , 2013. Edition of 20. Box: 6"(w) x 10"(h) x 3"(d). Book: 3.5"(w) x 9.75"(h) x 1"(d), opens to approximately 27". Materials: Nideggen and Ingres papers, Cherry Paperwood (veneer) paper, Cave Paper; Mylar; book cloth; Davey board, museum board; linen thread. Letterpress printed from handset Bodoni (bold and italic) and Onyx metal types, linoleum blocks, wood type, and photopolymer plates of handlettered words. 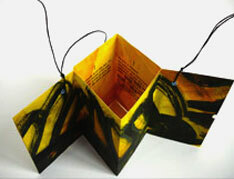 Book structure: a modified winged book designed by Alisa Golden . 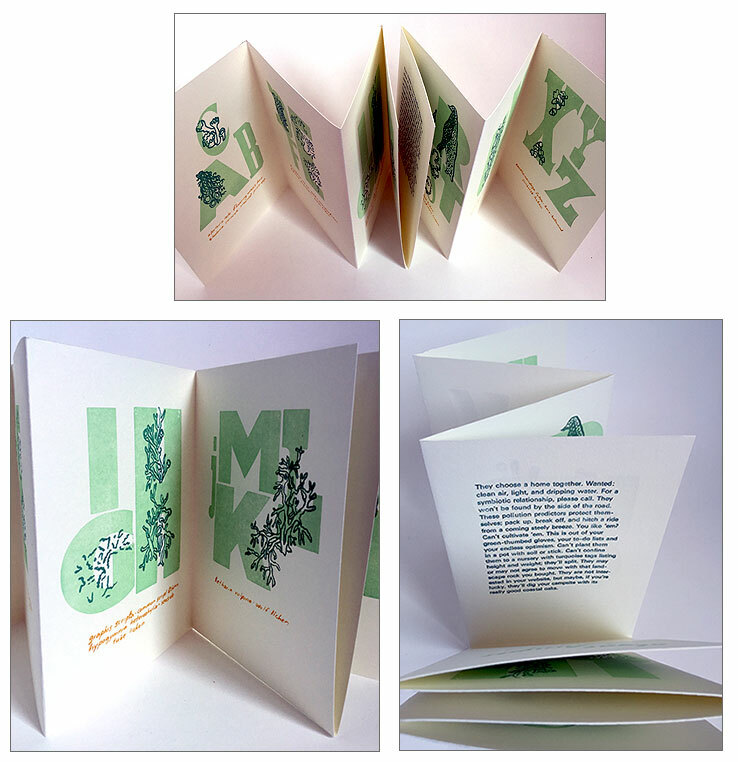 "Ideation Cards: technique: high-tech (letterpress, offset, or printmaking); layout: random or unplanned; paper: handmade; text: self-generated; image: none; color: monochromatic; structure: innovative structure (tunnel book, magic wallet, carousel book, flag book, etc); adjectives: textured, layered, impressionistic, transparent, ordinary or mundane. "A Lebbeus Woods exhibit at SF MOMA featured buildings that incorporated their own ruins, contained their own destruction. Could I create a book that appeared to be disintegrating, yet be structurally sound? 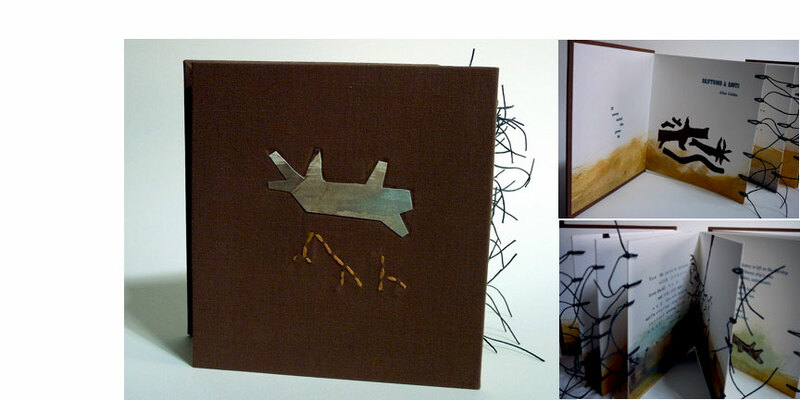 I began with an innovative structure I designed: the Winged Book. For the text, I had documented the seemingly ordinary demolition of a house; once fictionalized, that seemed right for the content. After I began to set the type by hand I saw I would only have enough letters for one section at a time; each section had to be condensed to 77 words. My type was also wearing out: I had to replace letters, change words, or grit my teeth and use a worn s or two. Incorporating its own destruction, already. As a cumulative piece, the sections are impressionistic. The printed words from photopolymer plates are random. 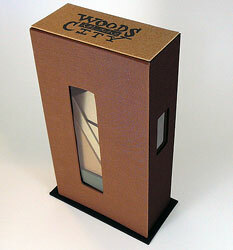 The building-shaped box to house the book has a transparent window. Because I could use no pictures I hope the writing presents vivid images for the mind’s eye." turns it into a garden. Berkeley, California: never mind the press, 2011. Edition of 40. 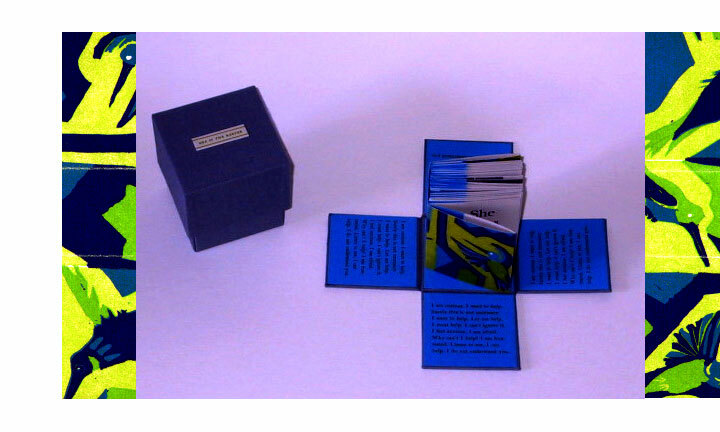 5.75 x 7.25 x 1.5" custom box containing 50 text cards plus colophon. Letterpress printed. Multicolored. Card sizes: 5 x 4.9"; 5 x 6"; 5 x 7". Handset metal type, wood type, and linoleum cuts. Printed on Stonehenge paper with a cylinder press. Cloth-covered upright box with a three-tiered card holder containing 31 cards dates, 12 cards for months, and 7 cards for days. 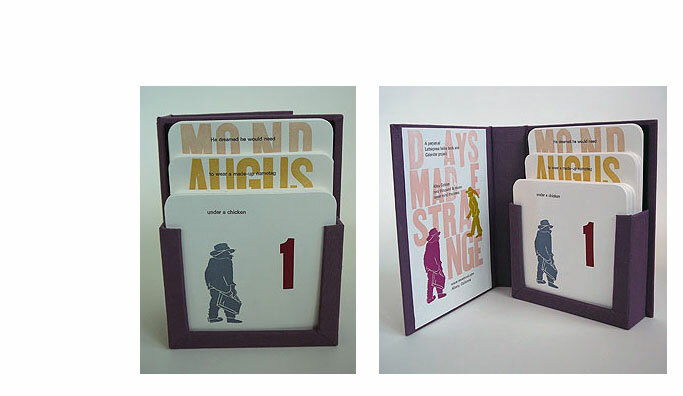 never mind the press: "Days Made Strange is a perpetual letterpress haiku bookcalendar with fifty loose prints in a holder: seven days, twelve months, thirty-one dates. A forever calendar that is also an interactive book and a work of art that can be displayed standing. "Each card is printed with a text fragment and together, the three daily cards make up one new haiku each day that will not repeat for many years. The front cards, the dates, have prints of people in different arrangements and colors. Interact with it like a book or use it as a calendar and be surprised daily. Thousands of haiku combinations are contained within." Berkeley, California: never mind the press, 2010. Edition of 36. 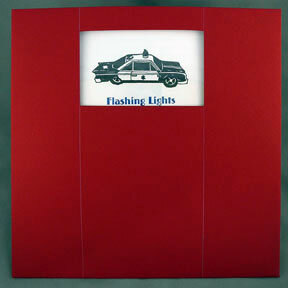 7.75 x 7.75"; cross flexagon book in a folded red paper sleeve. Letterpress printed from handset Univers type and photopolymer plates onto Lenox 100 paper. 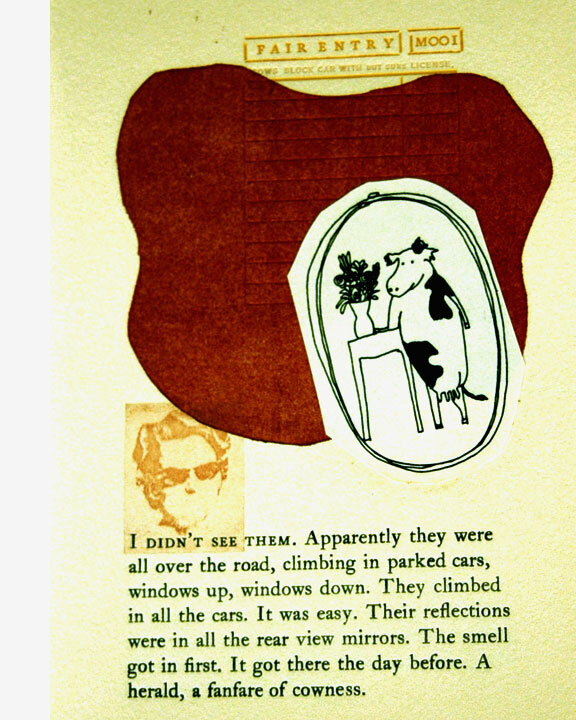 Paper sleeve has window cut-out, Mylar "windshield" sandwiched between the layers, printed white rule on the front, and a letterpress print from Cianna's drawing of a limousine on the back. Alisa Golden: "A surreal and rhythmic view of getting pulled over. Pull at the four rotating faces to tell the story: stay on course to get back to the beginning. "How to read this flexagon: Notice that there is always a cut in the center, either vertical or horizontal. 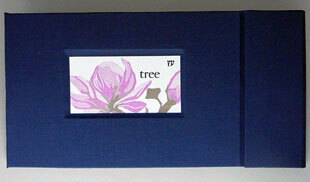 Pull open from the center to the outside for the book to flex along the score lines. If you are holding the book in your hand, pull up with your thumbs and push back with your fingers. Flatten. Read. Repeat. Repeat forever. It's a circle. Like life. After you have finished, slide flexagon into its red sleeve and take a nap." "Pull over when the lights flash in your mirror. Don't pull a fast one. Don't pull a U-turn. Don't hold my hand." Berkeley, California: never mind the press, 2009. Edition of 30. 5.25 x 5.125"; 18 pages. Letterpress printed from a linoleum block of carved leaves, wood type, handset metal Caslon Oldstyle type, and one photopolymer plate. Printed on Somerset 100% cotton paper. Coptic sewn with a curved needle using waxed red linen thread. Bound in printed bookcloth over Davey board. "A look at ladybugs and children. How do you get them to stay? Two women have different approaches." Berkeley, California: never mind the press, 2007-2008. Edition of 43. 4.25 x 7"; 16 pages. Handset wood and Caslon letterpress printed on D. S. Superfine paper with color copies and Photoshop manipulation. Red wrapper with altered tea box cover tipped on. 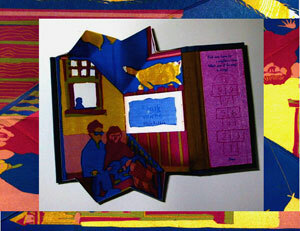 Originally 'Book T/ravel" was one of five books released in a one-year subscription Threads of Thoughtraveling by Golden. This is a book within a book. 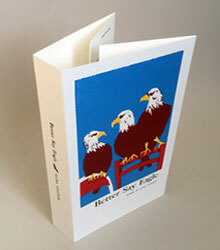 The larger exterior pamphlet (4.24 x 7") is letterpressed; the interior book (2.25 x 3") color copied and sewn into the center of the larger book. Alisa Golden: "One book or an anti-book? Traveling via reading, mostly to China. Altered tea box cover. Interior is one text treated different ways, some illegibly. And a list of what those who want to ban some books find objectionable, challenging these books for their content." Berkeley, California: never mind the press, 2008. Edition of 22. 2.75 x 5.75"; 10 panels. 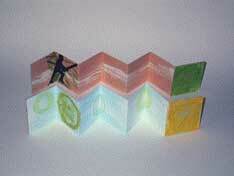 Checkbook structure designed by Alisa Golden. Created from paper painted with layers of acrylic ink and black gesso. Line drawings printed from photopolymer plates. Text is handset Bodoni printed letterpress on collected paper bags. Closed by wire bandoleer with ends wrapped in black linen thread to simulate crow's feet. Alisa Golden: "A conversation about crows, cards, and shoes occurs while I am walking back from the market." Berkeley, California: never mind the press, 2006. Edition of 14. 5.75 x 6.375"; 16 page double-sided accordion with first and last pages glued to boards. Letterpress printed on Somerset paper. Handset Bodoni (bold and italic) with Onyx titles. 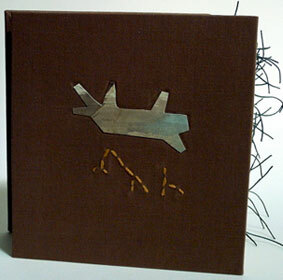 Bound in brown cloth with painted paper inset and embroidery on front board. Alisa Golden: "Two impressionistic poems about memory, water, and returning. Printed in a variety of teal and blue inks from handset type. Eight variations on seven linocuts of roots and driftwood printed in browns. Acrylic ink-washes at the foot of each page and on the back. 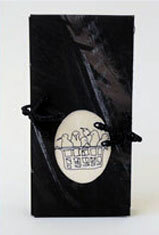 Japanese album accordion bound at the foredge with green-black waxed linen. 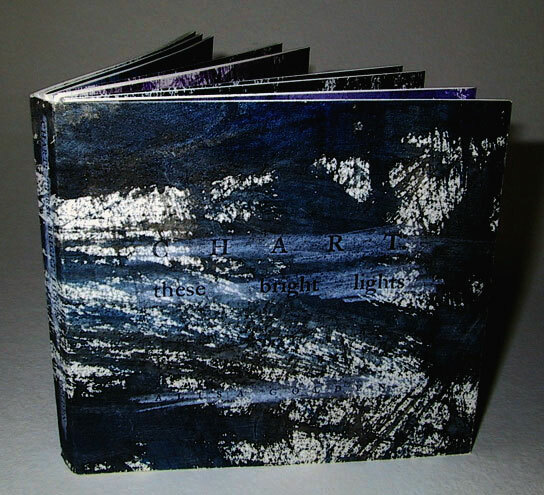 Inset paper painted to resemble driftwood with embroidered roots on the hard cover." Berkeley, California: never mind the press, 2005. Edition of 45. 8 x 6"; 8 pages. 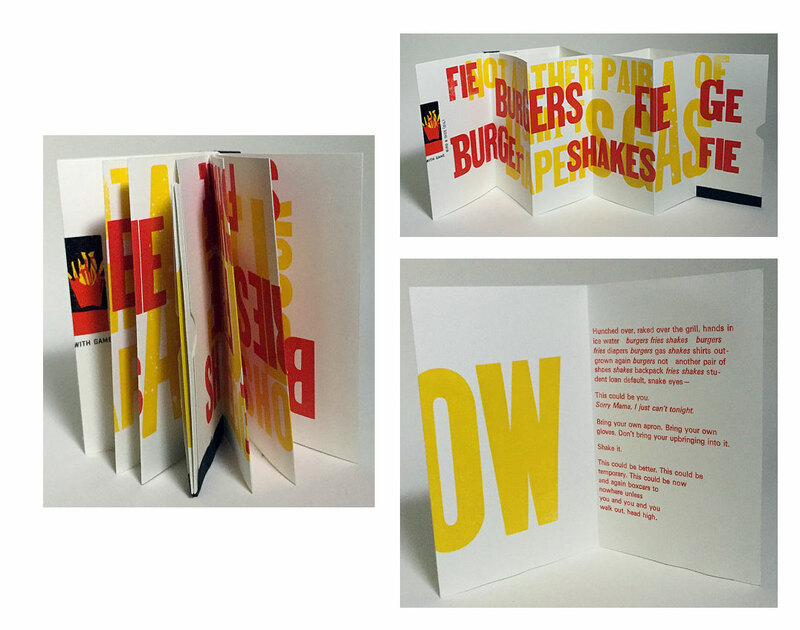 A slim, softcover, accordion book, letterpress printed from handset type. Linocuts are printed in single colors of blues or a pencil-yellow. 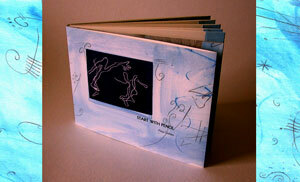 With graphite and painted paper covers and painted strips that join the pages. Numbers corresponding to pencil hardness (1B to 8B) stenciled in pencil. Alisa Golden: "Eight linocuts and eight poems about writing, drawing, teaching, and learning. Images are figurative drawings made from single lines, drawn at the ice skating rink." I used to hear these lines / now I say them. Berkeley, California: never mind the press, 2004. Edition of 37. 2.75 x 3.75"; 4 pages. Letterpress printed from handset type in silver-gray ink. 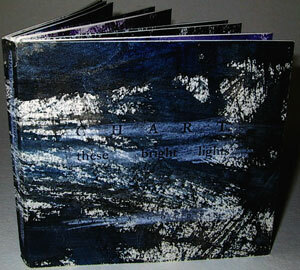 Four original hand-stenciled images with gesso and pearlescent inks, including the image on the cover. Glass bead on waxed linen thread as a toggle closure. Hard covers. T-cut maze structure: printed from one sheet of Stonehenge black paper. Alisa Golden: "Four pages of short text: a brief moment of understanding in the relationship of two people. She knew she had been trying to shout. Berkeley, California: never mind the press, 2003. Edition of 30. 4 x 6.25"; 8 pages. 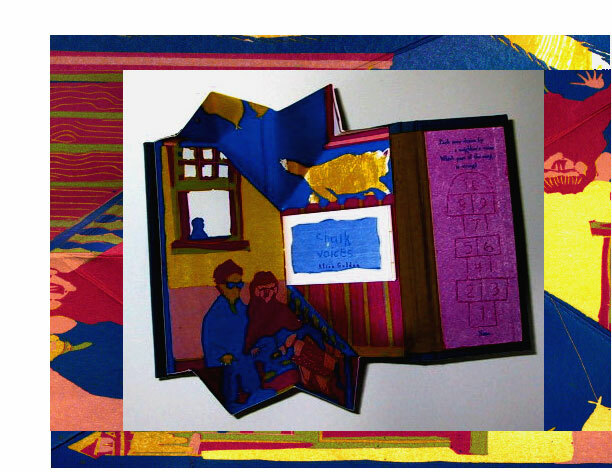 One pop-up page with a multi-colored reduction print. 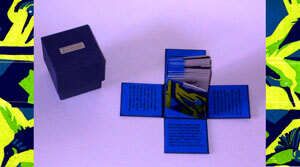 Interior contains a miniature booklet (2"; 8 pages) Typo Roman type printed in blue with rule printed in sun yellow. Three-section hardcover closed with a small brass hook. Alisa Golden: "One short poem and another very short poem set by hand from metal type and printed via letterpress. The poems are a symphony of sounds on a neighborhood street." Text: "I know my neighbor's cough, laugh, and vacuum." Berkeley, California: never mind the press, 2003. Edition of 41. 2.5 x 3" Six quotes from this first century stoic philosopher are printed in black with Caslon 471 Oldstyle type on Lenox paper and wood type Roman numerals printed in silver. Short paragraph biography in the back. Combination tabbed accordion-fold book with exposed coptic binding. Maroon bookcloth over museum boards. 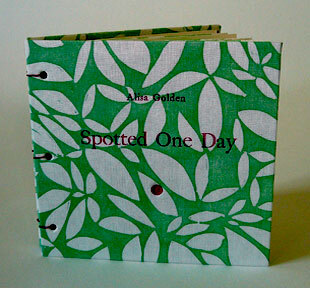 Back page is also a flap that wraps around the front and tucks into a pocket to close the springy book securely. Epictetus was lame, a slave, and although eventually freed, he was exiled by the emperor. Throughout these seemingly difficult situations he maintained a calm demeanor and positive attitude. Although he never wrote, his student Arrian posthumously compiled Epictetus' teachings in what is known as Discourses and a summary called The Enchiridion. Each teaching was given a Roman numeral. Book: 2.5 x 3"; 22 pages. Box: 3 x 3". Lift the lid off of this miniature box and the sides drop down, revealing text on the inner box and a miniature book within. Book printed letterpress from handset type on gray Stonehenge paper in blues and greens. Three linoleum cut illustrations printed in greys. Cover a reduction print of hummingbirds printed in blues and greens. Structure is a chunky, single-page flag book attached to a turquoise Canson accordion. Alisa Golden: "The text is a dream story about a mysterious box, curiosity, a desire to help, and a new understanding." She gets down, puts the box on the bed and opens the lid. California: never mind the press, 2003. Edition of 42. 6 x 8" 12 pages. Letterpress printed. Bound in cloth boards. 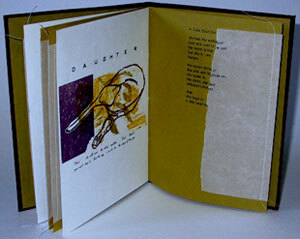 Alisa Golden: "Title is letterpress printed and inset into the hard cover. Brick red, Japanese bookcloth flecked with nubby strands of tan is used to cover museum boards, which house a slim single signature. Inside, thin tan Japanese paper alternates with a thicker white Kochi paper. Glassine is folded over the fore edges of the tan paper and machine sewed, providing extra thickness at the fore-edge and a torn profile on the page. Text is letterpress printed from handset Univers 55 type straddling the glassine. When you lift the glassine you notice a steamy, ragged edge in the middle of the printed text. Linoleum cuts of pots and pans and colographs are printed on the Kochi in four colors. "A range of poems, humorous, sad, and thoughtful that revolve around the kitchen." Berkeley, California: never mind the press, 2002. Edition of 42. 2.75 x 3" miniature book. Handset type and two relief prints letterpress printed on painted Lenox paper. Double-sided, seven-panelled accordion. Each side of the accordion opens “correctly” making it possible to open the book from either end. Painted hard covers with foil stamped title. Two poems about having presence and conquering fear. As his body moves / growing between the / cracks in the ground / his mind is / not moving. Berkeley, California:never mind the press, 1997. Edition of 32. 5.5 x 5"; 16 pages. 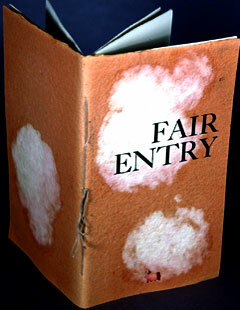 Circular, linen-taped accordion with painted pages. Letterpress printed Caslon 471 Shining on Lenox. Layered with acrylic inks and white colored pencil. Alisa Golden: "A quiet walk through a Japanese tea garden. Clearing leaves and cleaning out closets. Staring alone at a night sky that others have seen in other times. Each of these activities is a point in its own circle. 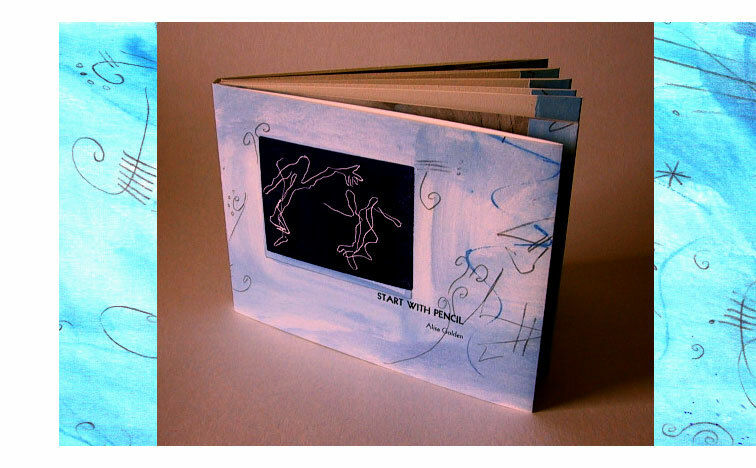 I have named them: ‘Walking on the Sentence Stones;’ and ‘On My Street: Fall;’ and ‘Chart: These Bright Lights.’ Together these books make up the Circle Series: accordion-folded paper with acrylic inks in colors reflecting the mood of each poem. I cut the papers into strips. Then I letterpress printed handset, metal type on top of the ink-washed pages and folded and joined the paper. "I always imagined I would have to choose between writing and art. Since 1983, making books has been a way for me to connect the two things I have to do, the things I thought were very separate. Making multiple copies allows me to let go of the work over and over and still keep it. My intention with the Circle Series was to create rhythm and mood, cohesive places in which to walk with my mind and with my hands. Places to be calm." Berkeley, California:never mind the press, 1990. Edition of 75. 4.75 x 8.5"; 14 pages. Letterpress printed on Rives heavyweight paper. With rubber stamping and collage. Colophon (cow-o-phon): "never mind that she isn't really collecting cow things but only recently noticed she does have a cow potholder, fingerpuppet, mask, wallhanging, and of course cowpunch and cow stamps for no waking reason. never mind that the word cattle is not as nice as cows, never mind the handset caslon type stampeding via letterpress on Rives heavyweight buff or the covers handmade from Maine paper cows by Beth Herrick and Heather MacDuffie of Port and Starboard Press, never mind that she doesn't eat cow anymore. cow's favorite music? mood music." Berkeley, California: never mind the press, 1989. Edition of 42. 10 x 7"; 20 pages. Letterpress printed on Rives bfk. Cover of ogura grey. 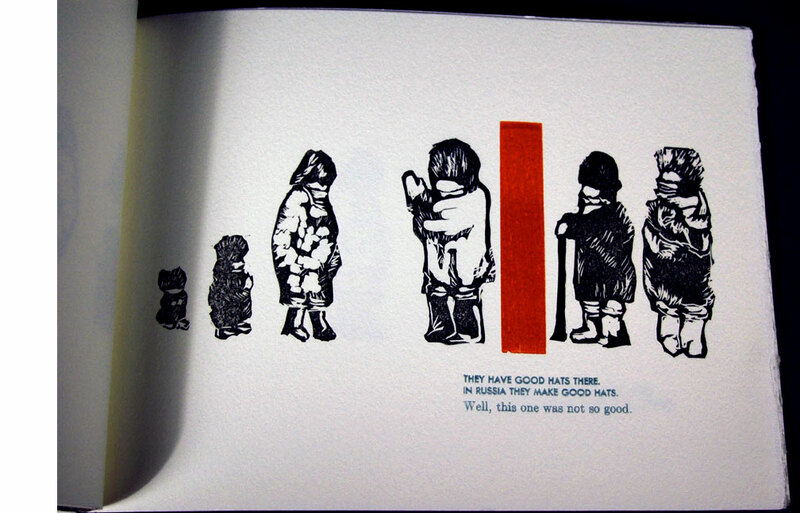 Illustrated using handcarved rubber stamps. “When I got to Moscow….I was the only one who didn’t have a hat.” From this begins one of those small but epic sagas that color our lives. Berkeley, California: never mind the press, 2008. Edition of 15. 3 x 4.75"; 8 pages. Letterpress printed from handset Univers and Jefferson Gothic type on 100% cotton Velin Arches paper that has been painted with acrylic ink. 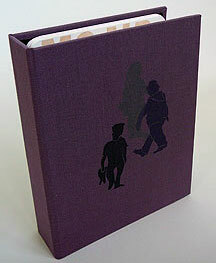 Bound with waxed linen and colored eyelets and housed in paper slipcase. Alisa Golden: "Four black swallowtail caterpillars lived on my parsley plants in June 2008. Two matured. I saw only one emerge, but evidence of the other. The chrysalis is the case where the change takes place. Slide the folded book out of the case to hold the paper butterfly in your hand. Pull open one page of this one-sheet book to read an interpretation of waiting, changing, and growing."